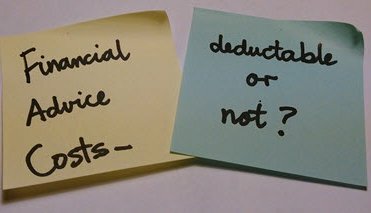 What Financial Advice Costs Are Deductible? Financial advice costs – deductible or not? Are any financial advice costs deductible? The short answer is that under current tax laws, claims are allowed for expenses only if those costs are incurred in gaining or producing your assessable income. Investment plan costs – are they deductible? The costs are incurred too early in the investment process to be directly related to gaining or producing assessable income from the investment. They are an expense associated with putting a possible income-earning investment in place, and so cannot be shown to have enough connection to that income (if there is any at all). The costs are an incidental expense and are an outlay to acquire the investment, and therefore this is an outlay that is capital in nature. Ongoing fees – are they deductible? Here’s some good news for you; The Tax Commissioner has declared that once the investment plan is in place, the ongoing fees or retainers made in relation that investment portfolio are typically deductible.